In May of 2017, Xiaoqing was interviewed and hired by the SBU Libraries. Since joining us she has become a valued and trusted employee of the Health Sciences Library. She is a welcome presence at the services desk, and is always happy to help a patron in need. We learned a great deal about Xiaoqing, and it is my honor to share some highlights of her journey at SBU with you! A citizen of China and graduate of Jinan University, Xiaoqing wanted to pursue a Ph.D. in the United States. Following this path, Xiaoqing applied to Stony Brook University and is now currently working on her Ph.D. in the School of Health Technology and Management. Her focus is on the mental health status and resilience of left-behind children (LBC) in rural China. Xiaoqing became passionate about LBC after a trip to Guizhou, China. As a volunteer for an LBC program, she was exposed to the developmental challenges suffered by children of migrant worker parents. Xiaoqing continues to work with a non-profit organization that contributes supplies to the LBC communities in an effort to improve their lives. 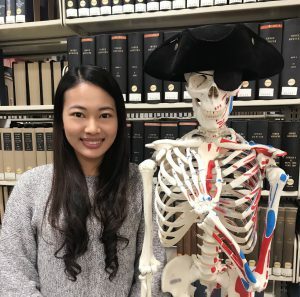 In addition to her research and volunteer efforts Xiaoqing is also an advocate for graduate students and is the elected treasurer of the Graduate Students Organization (GSO). She prides herself as a proponent for graduate students’ interests, especially international students who may be less represented within the University. Today, Xiaoqing is enjoying her time in the United States and being at Stony Brook University. She is excelling in her coursework and continues to study the problem of LBC’s and how to improve their health outcomes. For now, she simply expresses how grateful she is to be here. We here at the Health Sciences Library couldn’t agree more!